Development and manufacturing of a therapeutic stem cell product requires extensive quality control (QC) to ensure the identity, quality, and safety of the cells. Here, we describe our QC pipeline to optimize the manufacturing of our MultiStem adherent stem cell product, which is in clinical trial testing for stroke, acute myocardial infarction, inflammatory bowel disease, graft versus host disease, and solid organ transplantation. Screening for growth, marker expression, immunosuppression, and multipotent differentiation — in combination with “-omics” screening for gene expression, DNA methylation, and miRNA patterns — provides a comprehensive characterization of the cells, which facilitates further optimization of the manufacturing process. The application of adult stem cells in regenerative medicine has gained strong interest during the past decade. Clinical trials are investigating the efficacy of stem cells to treat disorders such as neurodegenerative and cardiovascular disease, immune disorders, bone and cartilage repair, and type I diabetes (1). Multipotent adult progenitor cells (MAPCs) are bone-marrow–derived, nonhematopoietic, adherent cells, which were first described by Jiang et al. (2). The MultiStem product is a therapeutic-cell platform based on MAPC isolation and expansion protocols. Preclinical animal studies have clearly shown therapeutic benefitsby improving cardiac function after heart infarction (3), preserving blood–brain barrier and improving neurological function after brain injury (4,5), promoting tissue regeneration after spinal cord injury (6) and ischemic limb injury (7, 8), and preventing graft versus host disease (GVHD) (9). The MultiStem product is in phase 2 clinical testing for use in treatment of inflammatory bowel diseases (ulcerative colitis), acute myocardial infarction (10), and ischemic stroke. A phase 1 clinical trial has just been completed using the product as an adjunct in allogeneic bone-marrow transplantation for preventing GVHD. 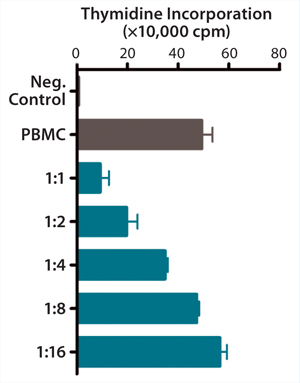 Studies have demonstrated that the benefits of MAPCs can be partly attributed to their proangiogenic effect (7, 11) and ability to modulate a patient’s immune system (5, 9). The immune-regulatory properties, in particular, are of paramount importance. MAPCs and the MultiStem product among are immune privileged, so they can be used for allogeneic products. Combined with a capacity to undergo extensive in vitro expansion doublings, these properties enable off-the-shelf use, with therapeutic MultiStem product available when needed and usable without patient matching. In advancing toward a final optimized manufacturing process, modifications of the MultiStem manufacturing process must be extensively controlled to keep product quality consistent. 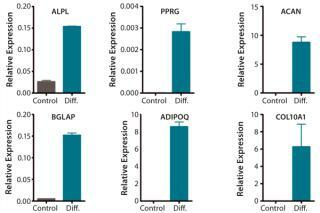 We have developed a panel of cell quality assays based on cell proliferation, differentiation, immune modulatory capacity, and gene and protein marker expression (Figure 1A – E, Table 1). One of the most advantageous in vitro features of our therapeutic product is its proliferative capacity. Cells can undergo >60 population doublings (PDs) before senescence. That extensive proliferation capacity allows creation of a master and working cell bank as production intermediates. The current manufacturing strategy is based on clinical doses generated at about PD28 (master cell bank campaign) or PD38 (working cell bank campaign). QC testing proceeds with a tiered strategy. First, cell identity is measured by marker gene and protein expression analysis using quantitative real time polymerase chain reaction (QPCR), enzyme-linked immunosorbent assay (ELISA), and flow cytometry (Table 1). For cells that pass those criteria, we perform multilineage differentiation assays that are typically associated with stem cells from mesenchymal origin. Osteogenic, adipogenic, and chondrogenic differentiation are measured through cytochemistry and the specific gene induction associated with each cell type (Figure 1C). As mentioned, our product’s mode of action in vivo is based on proangiogenic activity and immunosuppression. To support that capacity, we perform an in vitro tube-formation assay and a T-cell inhibition assay (Figure 1E and Figure 1D). We set up additional epigenetic assays to confirm consistency of our manufactured product and distinguish this product from other adherent stromal cells such as mesenchymal stromal cells (MSC). Our company is developing a QC assay based on telomere biology. The most important predictor for proliferative capacity may be telomere length and telomerase activity, and Boozer et al. showed that MultiStem telomerase activity is much higher than that of mesenchymal stem cells (12). In the context of biosafety, to demonstrate a normal MultiStem karyotype, we analyze copy number variation (CNV). 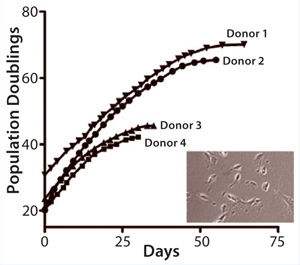 Cultured cells are compared with donor-derived, nonexpanded, mononuclear cells on SNP arrays, and the resulting data are analyzed for genomic insertions or deletions at a resolution of 50 kb. Altogether, these assays can confirm proper MultiStem identity, stem cell properties, and biological activity relevant to therapeutic action. “-Omics” Screens for Quality Control: Our current QC pipeline is sufficient to determine the identity of our product and lot-release assays for early to midstage clinical studies. But we expect that for late-stage clinical trials (phase 3) and product release, more stringent quality controls will be required by the FDA and EMA, particularly for potency and comparability following process improvements. So we are extending our QC pipeline with a series of genome-wide screening methods to comprehensively characterize the molecular phenotype of our product (Figure 2). Combining assay cost reduction with the availability of easy-to-use, publicly available software has allowed for routine microarray screens of mRNA expression. Transcriptome analyses revealed no substantial differences in gene expression among distinct expansions of cell batches derived from a single donor. Transcriptomics is thus a powerful tool in cell comparability testing. We also desire additional genome-wide screening methods that identify robust MultiStem markers and provide insight into the mechanisms underlying MultiStem function. An additional epigenetic tool to investigate identity and comparability is miRNA screening. The number of human miRNAs appears to be much smaller than the number of mRNAs, and each miRNA may have many mRNA targets (13,–15). Such profiles have been shown to determine the identity of stem cells (16). The miRNA profiles not only appear to be different for embryonic stem cells and adult stem cells, but they are also different for the adult stem cells MAPC and MSC (17). We are therefore exploring the possibility of using miRNA profiles to confirm the uniqueness of our expanded cell product. A breakthrough in stem cell quality control may come from emerging epigenetic analyses tools. Epigenetic modifications such as DNA methylation or histone modification can influence the function of associated genes. Stem cell identity is obviously related to epigenetic profile, and it has become clear that differentiation capacity is at least in part determined by epigenetic regulation, including DNA methylation and histone modification (18, 19). During stem cell differentiation toward a mature specified cell type, pluripotency genes become silenced by methylation, thereby reducing differentiation potential while cell specific genes can become expressed by demethylation (20, 21). Global DNA methylation patterns are reported to remain unaltered during stem cell expansion, whereas genes related to differentiation can change during in vitro passaging (22). The maintenance of unmethylated regions appears to be serum-dependent (23), suggesting a relationship among cell-expansion conditions, epigenetic changes, and pluripotency. Recently, we started a next-generation sequencing methodology to map cytosine-methylated regions in our product and explore the possibility of identifying DNA methylation markers that could serve as identity controls for epigenetic stability during expansion. Based on the advantageous proliferative capacity of our product, we developed a cell banking strategy that allows for production of >100,000 clinical doses from a single donor. Standard cell manufacturing strategies use serum, but the annual GMP-qualified serum supply is insufficient to meet projected commercial requirements (24). That limitation encourages development of novel manufacturing procedures for next-generation manufacturing, and two approaches have been followed. First, it is beneficial to develop a serum-free workflow, not only because of limited serum availability, but also because of batch-to-batch differences, the possibility of adventitious pathogens, and ethical considerations (25). Second, large-scale cell culture efficacy and production cost may be strongly improved through use of bioreactors instead of two-dimensional culture platforms such as trays and T flasks. MultiStem clinical production is currently performed by Lonza, a contract manufacturing organization (CMO), which creates master cell banks and runs production campaigns starting from those banks. A production run typically generates 40–50 clinical doses. Clinical dose varies by indication, but current production units contain 180 million cells. They are cryopreserved and stored in a mixture of Plasma-Lyte electrolytes from Baxter, dimethylsulfoxide (DMSO), and human serum albumin. Each production run is sterility, mycoplasma, and endotoxin tested. The product is also tested to confirm a normal karyotype. Only after completion and validation of all tests is the product released from the CMO and stored for sites that take part in MultiStem clinical trials. Currently, the product has a validated shelf life of over five years. 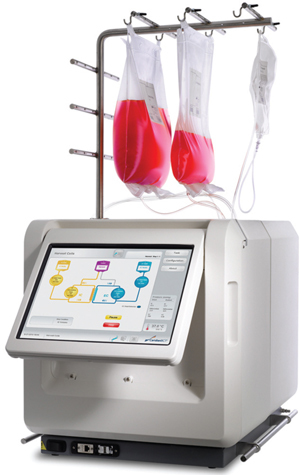 edia perfusion platform with gas exchangers. We have tested this system to optimize the complete workflow of MultiStem culture, including stem cell isolation from bone marrow and expansion up to the clinical-dose scale. 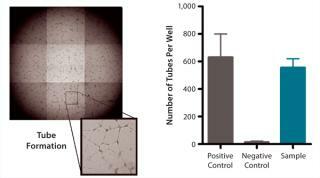 Quality control was performed to verify that characteristics of cells harvested from the Quantum system were comparable to those obtained under standard cell culture conditions. All indications point to successful MultiStem expansion in the new bioreactor format, with significant advantages in reduced air-handling requirements and labor requirements. We anticipate that phase 3 MultiStem studies for several clinical indications will have integrated serum-free media formulation and production in such a closed bioreactor format. Corresponding author Bart Vaes, PhD, is a senior scientist, David Craeye is a scientist, and Jef Pinxteren is manager and head of R&D at ReGenesys BVBA, Gaston Geenslaan 1, 3001 Heverlee, Belgium; 32-16751352, fax 32-16751351; bvaes@regenesys.eu. MultiStem is a registered trademark of Athersys, Inc. 1.) Busch, SA. 2011. Mesenchymal Stromal Cells As a Therapeutic Strategy to Support Islet Transplantation in Type 1 Diabetes Mellitus. Cell Med. Part B 2:43-53. 2.) Jiang, Y. 2002. Pluripotency of Mesenchymal Stem Cells Derived from Adult Marrow. Nature 418:41-49. 3.) van’t Hof, W. 2007. Direct Delivery of Syngeneic and Allogeneic Large-Scale Expanded Multipotent Adult Progenitor Cells Improves Cardiac Function After Myocardial Infarct. Cytother 9:477-487. 4.) Mays, RW. 2010. Development of an Allogeneic Adherent Stem Cell Therapy for Treatment of Ischemic Stroke. J. Exp. Stroke Transl Med 3:34-46. 5.) Walker, PA. 2010. Intravenous Multipotent Adult Progenitor Cell Therapy for Traumatic Brain Injury: Preserving the Blood Brain Barrier Via an Interaction with Splenocytes. Exp. Neurol 225:341-352. 6.) Busch, SA. 2011. Multipotent Adult Progenitor Cells Prevent Macrophage-Mediated Axonal Dieback and Promote Regrowth After Spinal Cord Injury. J. Neurosci 31:944-953. 7.) Aranguren, XL. 2011. MAPC Transplantation Confers a More Durable Benefit Than AC133+ Cell Transplantation in Severe Hind Limb Ischemia. Cell Transplant 20:259-269. 8.) Aranguren, XL. 2008. Multipotent Adult Progenitor Cells Sustain Function of Ischemic Limbs in Mice. J. Clin Invest 118:505-514. 9.) Kovacsovics-Bankowski, M. 2009. 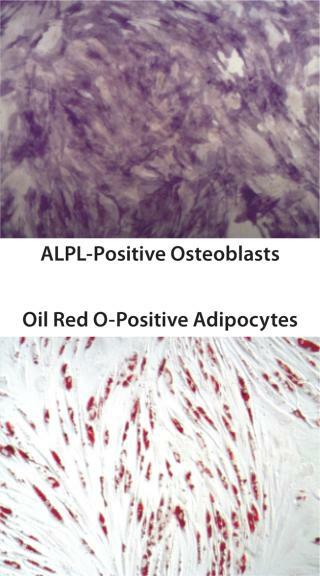 Clinical Scale Expanded Adult Pluripotent Stem Cells Prevent Graft-Versus-Host Disease. Cell Immunol 255:55-60. 10.) Penn, MSAdventitial Delivery of an Allogeneic Bone Marrow-Derived Adherent Stem Cell in Acute Myocardial Infarction: Phase I Clinical Study Circ. Res. 11.) Aranguren, XL. 2007. In Vitro and In Vivo Arterial Differentiation of Human Multipotent Adult Progenitor Cells. Blood 109:2634-2642. 12.) Boozer, S. 2009. Global Characterization and Genomic Stability of Human MultiStem, a Multipotent Adult Progenitor Cell. J. Stem Cells 4:17-28. 13.) Karginov, FV. 2007. A Biochemical Approach to Identifying MicroRNA Targets. Proc. Natl. Acad. Sci USA 104:19291-19296. 14.) Hanina, SA. 2010. Genome-Wide Identification of Targets and Function of Individual MicroRNAs in Mouse Embryonic Stem Cells. PLoS Genet 6:e1001163. 15.) Li, SS. 2009. Target Identification of MicroRNAs Expressed Highly in Human Embryonic Stem Cells. J. Cell Biochem 106:1020-1030. 16.) Chen, C. 2007. Defining Embryonic Stem Cell Identity Using Differentiation-Related MicroRNAs and Their Potential Targets. Mammal Genome 18:316-327. 17.) Aranda, P. 2009. Epigenetic Signatures Associated with Different Levels of Differentiation Potential in Human Stem Cells. PLoS ONE 4:e7809. 18.) Bloushtain-Qimron, N. 2009. Epigenetic Patterns of Embryonic and Adult Stem Cells. Cell Cycle 8:809-817. 19.) Weishaupt, H, M Sigvardsson, and JL. Attema. 2010. Epigenetic Chromatin States Uniquely Define the Developmental Plasticity of Murine Hematopoietic Stem Cells. Blood 115:247-256. 20.) Villagra, A. 2002. Reduced CpG Methylation Is Associated with Transcriptional Activation of the Bone-Specific Rat Osteocalcin Gene in Osteoblasts. J. Cell Biochem 85:112-122. 21.) Kang, MI. 2007. Transitional CpG Methylation Between Promoters and Retroelements of Tissue-Specific Genes during Human Mesenchymal Cell Differentiation. J. Cell Biochem 102:224-239. 22.) Bork, S. 2010. DNA Methylation Pattern Changes upon Long-Term Culture and Aging of Human Mesenchymal Stromal Cells. Aging Cell 9:54-63. 23.) Dahl, JA. 2008. Genetic and Epigenetic Instability of Human Bone Marrow Mesenchymal Stem Cells Expanded in Autologous Serum or Fetal Bovine Serum. Int. J. Dev Biol 52:1033-1042. 24.) Brindley, DA. 2012. Peak Serum: Implications of Serum Supply for Cell Therapy Manufacturing. Regen Med 7:7-13. 25.) van der Valk, J. 2004. The Humane Collection of Fetal Bovine Serum and Possibilities for Serum-Free Cell and Tissue Culture. Toxicol In Vitro 18:1-12. 26.) Antwiler, GD, KT Nguyen, IK McNiece Parekkadan, B and M. 2009.Bioreactor Design and ImplementationStem Cell Bioengineering, Artech:49-62.